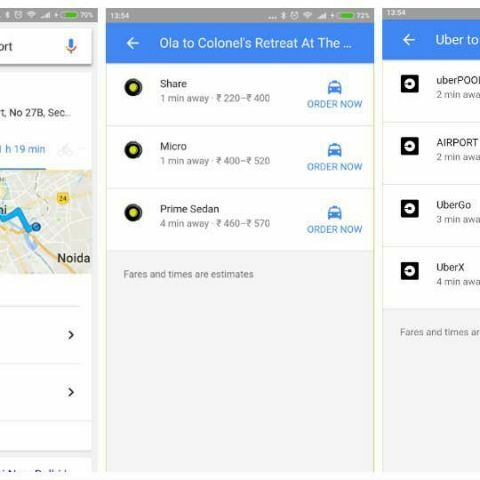 Google has announced that users in India will now be able to ask for a cab from either Ola or Uber via the Google Search app, or the mobile browser. With these features, users in India will be able to ask Google for directions and then book a ride directly via search. Further, users will also see a tab for ride services from both on-demand cab services, as well as fare estimates and pick up times if a car is located near their location. When asking for more specific information like, “Uber to the airport” or “Ola to the airport,” the Google search app or the browser will direct users to select a service, and then opens the app to let users to book the cab. If the app isn’t installed, users will get a link to download the app. These features were made available in Google Maps earlier this year. This includes a dedicated tab with information for cab services besides the existing tabs for driving, public transport and walking options.